Another Supercomputing event has passed, with this year being our largest to date! 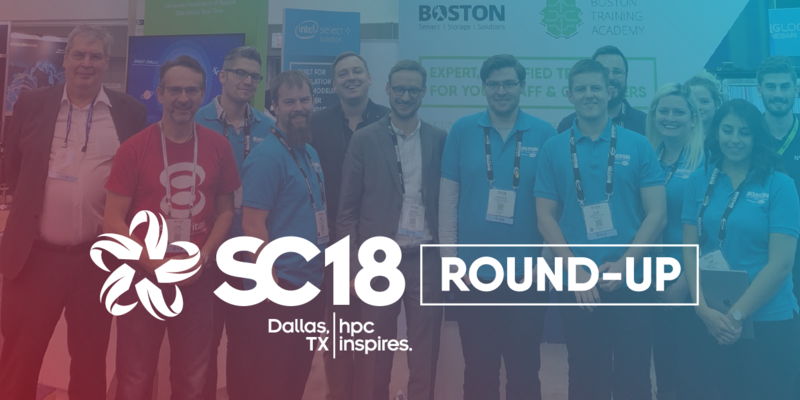 Our stand at SC18 was one of the largest and busiest shows Boston have had! We hosted live demonstrations from NYRIAD® and NVIDIA® while displaying several of our enterprise-grade servers, competitions, joint happy hour drinks and a customer dinner! Continue reading below for your full Supercomputing roundup. Built in partnership with NYRIAD®, our Boston Igloo Nebari utilises NSULATE™ for modern GPUs to perform storage-processing operations. In addition to enabling many new processing solutions, it can be configured as an alternative to RAID and perform GPU-accelerated erasure coding and cryptographic checksumming. NYRIAD®'s Warp Drive demonstrations, performed live at Supercomputing by Alex St. John, displayed the high resiliency, low power consumption and minimal data movement of NSULATE™ using Micron drives. As you can watch in the video, removing drives from an active array doesn’t impact its functions or performance! Developed in partnership with Excelero, Mellanox, Micron and Supermicro, this revolutionary NVMe over Fabric solution delivers a scalable converged infrastructure for next-level production. The Flash-IO Talyn solution delivered a sequential read of 44GB/s using 4MB blocks and a random read of 840k IOPS using 4k blocks when paired with NVIDIA DGX-1 during benchmarking. Read our press release including our impressive benchmarks! Featuring 8x NVIDIA® Volta® V100 GPUs in 4U connected by NVLink®, the Boston ANNA XL can be optimised for your Deep Learning applications. Why Volta? From scientific discovery to Artificial Intelligence, high-performance computing (HPC) is an important pillar that fuels the progress of humanity. Modern HPC data centres are currently solving some of the greatest challenges facing the world today. With traditional CPUs no longer delivering the performance gains they used to, the path forward for HPC data centres is GPU accelerated computing. NVIDIA Tesla V100 powered by NVIDIA Volta™ architecture is the computational engine for scientific computing and artificial intelligence. NVIDIA® was on our booth at Supercomputing 2018 to demonstrate the power of their V100 in HPC Visualization! With up to 3X faster time-to-solution over the P100, the Tesla V100 with NVLink is the most advanced data centre GPU ever built to accelerate AI, HPC and Graphic workloads whether in a PCIe or SXM2 form factor. Get in contact for testing, leasing and other creative solutions from Boston; NVIDIA® Elite Solution Providers. Fresh-off an amazing award-winning season, Asperitas joined us at Supercomputing to talk about their disruptive Immersed Computing® solution. Often described as the “datacentre in a box”, their AIC24 is a plug and play solution that utilizes natural convection to exchange heat from the modules for a clean, quiet finish. Our Intel® Select Solution has been tailor-made for modelling and simulation with Intel® Xeon® Gold CPUs, Intel® SSD DC Family storage and Intel® Omni-Path connectivity included! These Intel-verified solutions are aimed to speed selection and deployment of datacentre and communications network infrastructure. Solutions listed above, and more, are available for testing in our Boston Labs! There was huge interest on the stand as attendees had 3 chances per day to win prizes - Including the 3 Amazon Echo Dot's and 6 HD Camera RC Drones! Huge thanks to our sponsors! Without whom Supercomputing 2018 would not be possible. Sign up to our newsletter and receive information about where you can next see their system in action!